Bangladesh Air Force Job Circular brings new opportunities. 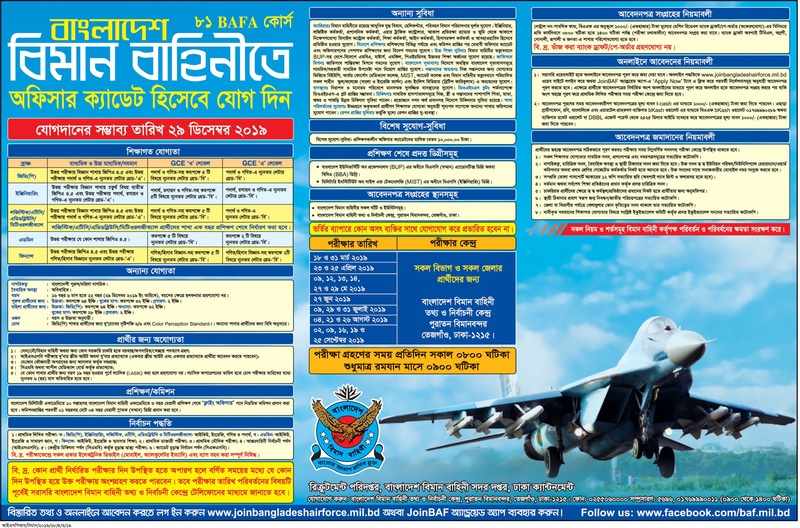 Every year Bangladesh Air Force publishes the recruitment notice. It recruits human resource in different positions. Not to mention, It is one of the strongest forces in Bangladesh. The unemployed youth community of Bangladesh has tried very hard to join the air force. If you want to get all other job-related information, this is the best job information site of Bangladesh. Moreover, Do not contact a bad person during admission. False certificate or address will harmful to the candidate. The military forces of Bangladesh include the members of Army, Navy and Air Force. In addition, the President of Bangladesh is the Commander-in-Chief of the military. Similarly, Bangladesh’s military formed during the liberation war on 21st November 1971. In this case, this day is Armed Forces Day. On this day, various programs are arranging in Bangabhaban. Dhaka, military headquarters, Dhaka cantonment and every military establishment of the country. As a matter of fact, To apply for technical trade, you should get GPA 3.5 from the science department in the SSC examination. On the other hand, to apply non-technical, GC, provost, need GPA 3.5 in the SSC examination. For music trade= GPA 2.5. To apply for provost and GC Trade, the height should 5 feet 8 inches. For all other trades, height is 5 feet 6 inches. See the job circular to get detail information, including appointment date for each district. Any kind of recommendation during admission will be considered as the inefficiency of the candidate. From our website, you can get Bangladesh army job circular 2019 and Bangladesh navy job circular 2019. Bangladesh air force, a part of Bangladesh armed force. This force has 17,000 members and has more than 3500 pilots. The Bengal Air Force will take the oath of ‘Bengal’s sky-free’. Bangladesh air force started with just three aircraft, including a Dakota Biman, an aator and an Aluet-3 helicopter. The first fighter plane of this force was the Saber F-86 which was left in 1971, left by the defeated Pakistani air force. Head office of Bangladesh Air Force (Headquarters) is located in Dhaka Cantonment. Operations and training, Operations & Training, Administrative or Administrative, and Maintenance or Maintenance is managing by the headquarter. Each branch is managing by three Air Vice Marshal rank officers. Bangladesh air force has two important departments that are gradually branches and trades. Equally important, Bangladesh Air Force Job Circular 2019 bring out a great career opportunity. General Duties (Pilot), GD (P) [Aerial], General Duties (Navigator), GD (N), Money, Administration, Control of aircraft defense weapons, Air direction control or ATC, Education, Engineering, Law, Supply & weather. These branches are called Squadron. These divisions are base on the Bangladesh Air Force. Each division is different so the benefits are to work. As well as, Aircraft Engineering, Electrical & Mechanical Engineering, General Engineering, Vehicle Transportation Engineering, Weapon Engineering, Radio Engineering, Land signals, Radar Control, Life Saving Equipment, Photograph, Air direction control, Education, Detective, Weather, Treatment, Secretarial, Supply, General Service etc. Finally, we want to say that our job circular website is always engaged in your service. You can easily get job exams, job study, recruitment notice related information from here. If you like or want to give advice, then please comment below. Please, make sure your comment in English. Otherwise, we can not approve your comment for terms & condition. Thanks to all to stay here. Please, See the job circular carefully.